Pallas Kunaiyi-Akpanah looks on in glee. The freshman enjoyed a breakout game Thursday in just her second career start, notching a double-double. The stars seemed to align Thursday for Northwestern, and Pallas Kunaiyi-Akpanah took full advantage. Making just her second career start, the freshman forward recorded a double-double with 14 points and 14 rebounds, helping the Wildcats (13-4, 2-3 Big Ten) to a stunning 86-82 win over No. 5 Ohio State (12-4, 4-1) on Thursday at Welsh-Ryan Arena. Both figures were career highs for Kunaiyi-Akpanah. Kunaiyi-Akpanah especially excelled in the second half, scoring 8 points and adding eight rebounds. Many of her tallies came during an Ohio State run late in the fourth quarter that brought the Buckeyes to within 5. 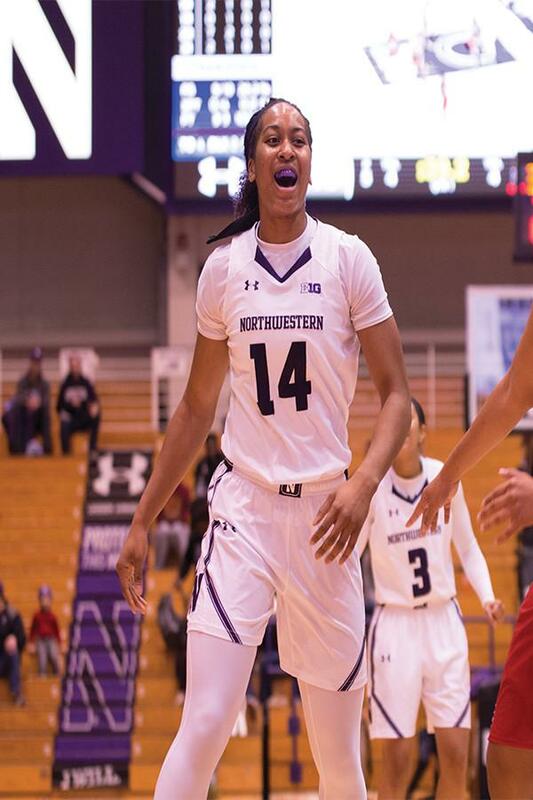 She grabbed an offensive rebound and scored the putback to put NU up 12 with under six minutes to play. A couple minutes later, she had subpar positioning yet leaped above an Ohio State player to grab the ball. Less than 30 seconds later she took a pass from junior guard Christen Inman and scored, extending NU’s lead to 14. Kunaiyi-Akpanah’s performance far outclassed any previous effort from the center position for the Cats this season. Senior Christen Johnson, who started 14 games this season, has not scored in double figures nor had at least 10 rebounds in a single game this season. On Thursday, Johnson played just two minutes and did not score. Her growth on putback plays was especially noticeable. She had two such plays on Thursday; in Sunday’s loss to then-No. 23 Michigan State, she had four offensive rebounds but did not score. She scored just two points in a loss to Purdue on Jan. 7. Against the Buckeyes, however, Kunaiyi-Akpanah looked like a different player. Ohio State coach Kevin McGuff was among the many impressed.